Pinot Noir is, to put it one way, high-maintenance. At its best it is one of the most sublime wines you’ll ever drink. For it to be at its best you need a statistically unlikely combination of moxie, knowhow, patience, good airflow and dumb luck. 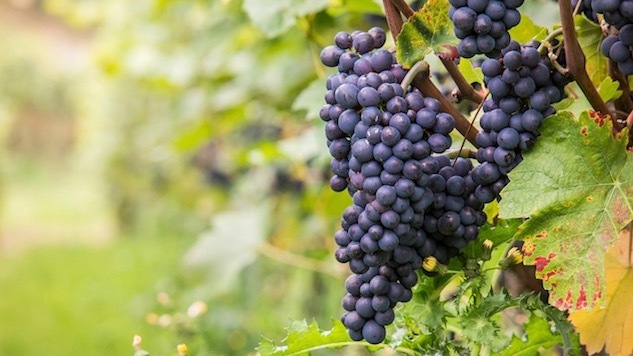 Pinot Noir (and all its cousins, for that matter) is a cool-climate grape. It has a tendency to mutate. Its super-tight clusters make it uniquely prone to mildew and rot. It’s thin-skinned, literally and figuratively, so tannin levels are low, color saturation is modest, and aging is unpredictable. Meaning as diligent as you are in the vineyard, you are not home free once the grapes come inside. Pinot can turn on you at any point, which is why it tends to be rather expensive. In addition to making still red and rosé wines around the world, it is also a primary grape for Champagne and its Italian cousin, Franciacorta. Pinot noir’s hallmark notes will vary somewhat by region, but in general, you’re likely to get black cherries, “forest floor” notes, often cola or coffee or cocoa, violets, herbs, tobacco, mushrooms, vanilla and cloves. If you’re thinking about Thanksgiving, Pinot Noir is generally a slam-dunk companion to roast turkey. Its other best friends include salmon, mushrooms (especially morels) and truffles, meat that has been charcoal-grilled or smoked (it likes smoke a lot). Dialed-down Alsatian pinots are great with ham and charcuterie, and from my personal experiments, split pea soup. More robust ones appreciate duck, tuna, beets and other root veggies, white pizzas, any dishes that incorporate cherries or blueberries or dried figs. It’s also great with blue cheeses (especially the more mild-mannered ones) and gruyere. In short, it makes up for its finicky nature in the field by being quite the opposite on the table. There’s a pinot for everything. You might notice that my lengthy list of wines made from the emblematic grape of Burgundy is basically devoid of actual Burgundian Pinots. Why? No reason at all, other than that I’m compiling things I’ve found interesting recently and I happen to have tasted a lot of American Pinots. For sure, the offerings of great stuff from France are vast. Meanwhile, other hot spots for this grape (which are technically cool spots for the most part) include Oregon’s Willamette Valley, The Los Carneros region of Napa-Sonoma, The Santa Cruz Mountains, and San Luis Obispo. Some great stuff comes out of Alsace (especially sparkling wines; still red Pinots can be great too but tend to be really restrained, occasionally too much so for my taste), and many other regions in both hemispheres. Good Pinot Noir is often quite spendy, largely because it is a volatile grape and so many things can go wrong. I’ve tried to take a “something for everyone” approach, from weeknight juice to giftable rarities and treasures. At any rate, this ought to keep you occupied for a while. Cheers. Artesa makes a range of Pinots, of which this one is the most accessible and easily found. On the lavish end of the Pinot spectrum, this wine’s full of cherry, plum and rose petal notes on the approach and unfolds into an array of berry notes (blueberry, strawberry, boysenberry) with baking spice and a bit of earth on the finish. Balanced, great acidity, lively. Santa Cruz Pinots are, like many things about that area, a little different. Where other West Coast Pinot regions tend to produce showy, pyrotechnic, luxe wines, there’s been a movement in this enclave of iconoclasts toward leaner, pared down Pinots. There are many great ones, including this mandala-labeled character from Armitage. It’s dignified and restrained, with lovely Pinot Noir cherry-ness that’s deep and intense without being “explosive.” Firm tannins, good structure, earth and herb notes galore. It has a quiet but expressive character and is equally at home at the dinner table or flying solo (in a decadent mood I’d pair it with a handful of truffle-salted potato chips and be very happy). OK: Imagine you are in a grove of bay laurel trees with a nice breeze blowing across a nearby lavender field and you open a box of chocolate covered cherries and inhale. That. This wine is silken, very aromatic, herbaceous, cherry-hearted and wonderfully layered. Very silky, very vivid, and pronouncedly earthy (forest floor and mocha notes) while still retaining the fresh cherry note that lets you know this is a Pinot. Full-figured and sturdy, it has a mouth-coating quality and a strong finish. There’s an intriguing and relatively unusual note of citrus peel here that adds a very distinctive quality to this wine. Little hints of cinnamon and vanilla round it out. Brandborg is a little south of the Pinot-Valhalla known as the Willamette Valley, which is good news because the less trendy zip code makes the price point more accessible. A blend of Pinots from different vineyards on the Umpqua River, the Bench Lands Pinot shows a strong soil and stone influence, a strong garnet color, and a lavish, effusive bouquet of cherry and blueberry that unfurls into notes of nutmeg and cinnamon, earth and toast, vanilla and black raspberries. Good tannin structure. As befits an Oregon riverbank wine, this bottle’s sweet spot might be alongside a piece of grilled salmon. This hand-harvested Chilean Pinot is a relative bargain and a likely crowd-pleaser. Warm, with smoke and leather notes in addition to the classic black cherry and violet notes, and a fairly prominent hint of baking spice and vanilla. Good balance, friendly character. Cooper Mountain has an eclectic range of biodynamic wines including several different Pinot Noirs; if you like this one, look out for their old vine release or the “Life” (no sulfite added) Pinot (they have a great rosé too). This one is a rich, “liquid velvet” type of wine with a strong forest floor character (a complicated accord of notes that evoke leaf litter, mushrooms, forest berries and shade-dwelling flowers like violets). Cola, blackberry, confit cherry and raspberry are also present. Supple tannins. Full-bodied enough to stand up to red meat but like most Pinots, also a pleasing partner for oily fish (especially salmon or steelhead), poultry, or wild mushrooms. Restrained, with a rather subdued nose-it opens up with a little time in the glass. Damp earth character on the approach. It takes a few minutes to open up in the glass, but when it does it’s very subtle and pleasant, with wild strawberry and raspberry notes and a trace of mushroom or forest floor. I think this wine is a special friend to pork if that is your thing. If you are a fan of very fruit-forward reds this is a Pinot Noir you will probably love. It’s intensely fruity (raspberry, cherry, blueberry, pomegranate, plum) and has a “juicy” character. Grace notes include roses, cola, vanilla and nutmeg. Bright, with fresh acidity and a plush texture. Approachable, versatile, friendly. Finesse and site typicity are hallmarks of Gary Farrell wines and I’ve never had one that wasn’t delightful. Vibrant without being a showoff, nuanced without being difficult to understand, this is a spicy Pinot (I get cloves, peppercorn, cinnamon and allspice) with a “grown-up Cherry Coke” note at its heart. Supple body, good acidity, firm tannins. There are forest floor traces on the finish along with cranberries (or pomegranate, or rhubarb, it’s elusive but something tart and red) as well as black tea and a hint of vanilla. Contemplative, and definitely interested in whatever you’re eating. Seductive and spicy, with a cherry cola nose. Sandalwood, cedar, cinnamon, clove, pepper. Plums, a bit of cherry, and a slight hint of toast or graham cracker. The finish is slightly savory and nicely balanced. Willamette Valley classic. If you like your Pinots layered and shifting and unfurling, this is a wine to look for. Rainier cherry, cloves, cinnamon, pepper, allspice, cedarwood, sandalwood, blackberry, black tea, leather, white flowers…it kind of just keeps going. Super balanced, fine minerality, really delicious. A great companion for braised meats or roasted root veggies. This is, I think, the highest ABV wine on this list, so if you like your Pinot gaunt and restrained, be warned this one’s made for folks who like ‘em hotter. Bold, pretty intense, it shows dominant notes of blackberry and cola, with cinnamon toast and vanilla accents. Powerful stuff. Pairing it with roast pork would not be a bad idea. An opulent Pinot with a saline finish. It’s deep, but not ponderous. Resinous florals (lavender, rosemary) and dark fruit notes (black raspberry, Bing cherry) dominate, but it does what really good Pinot Noir does and keeps throwing out new ideas as you drink it. Violets? How about leather? Maybe some mint? A little shale? This is a seriously wine-geek-worthy wine and even if you are not a Pinot scholar you can’t not notice its gracefulness and depth. Not cheap. Worth tracking down. Spicy. Cinnamon and allspice stand out on the nose and on the finish, which is in the “lingering” range. Black tea, wild strawberries, pastry, lavender, and blackberries. Very nice silkiness. No fining or filtration on this one, for those who pay attention to that (vegans, for example). This wine is intense yet easygoing, which is a pleasant combination. Clear, light-bodied and bright, this Russian River Pinot is not as splashy and intense as some of its neighbors in Sonoma County; it is subtle and delicate and pretty dang quaffable. Vivid acidity balances a strong tendency toward savory, earthy notes; there’s a lot of mushroom and black tea character to this wine. Woodsy accents of cedar and violet. Ruby Vineyard has some of the oldest Pinot Noir vines in Oregon, though the winery is relatively new. This Pinot is on the intense side, with a dense cherry-forward nose that also features a rather brooding array of spice notes (peppercorn and nutmeg especially). Tannins in the range commonly referred to as “dusty.” Good acidity. Raspberry and blackberry on the finish. There’s a type of minerality people usually refer to as “dusty,” which this wine has, that I sometimes find hard to reconcile with words like “vibrant,” which this wine also is. But Santa Cruz is all about unexpected contrasts. Relatively brisk tannins for a pinot. A bright cherry note at the core, accented with rosy florals, a lot of wood notes (cedar mostly) and a little hint of cherry cola. Delicate and subtle, with more of a raspberry core than the more typical cherry note associated with the varietal. Oolong tea, Sichuan pepper, and a bit of cherry on the mid-palate. Slightly ethereal finish. This is a very subtle wine and a pleasure to drink. Currently Sokol Blosser is donating a portion of profits from this wine to a honeybee welfare nonprofit so if you want to support an additional cause (other than the entirely worthy one of getting some nice wine into your mouth) these guys are worth checking out. Stellar is one of the largest producers of organic and fair-trade certified wines in South Africa (which is saying something since South Africa is way ahead of the pack on that front). There’s a romantic quality to this wine; it’s luxuriant and a little candied. Forest floor notes play against cherry and blueberry; there’s a hint of sweet flowers (rose and violet) and a light, subtle tannic structure. If you like duck, this wine also likes duck. One of the winemaker’s suggested pairings is chocolate dipped strawberries and I wouldn’t disagree at all. Accessibly priced for the quality and region. Storrs makes a very affable Pinot with a nice balance of elegance and approachability. It’s spice-forward, with aromatics of clove, nutmeg, allspice and pink peppercorn, as well as roses and a little bit of tea. Berry core with a trace of plum and a bit of a stewed strawberry thing. Savory, resinous herb finish (bay laurel, sage, thyme, a tiny hint of mint). A fabulous fall food wine, something to open when the air smells like wet leaves and the kitchen smells like homemade chicken soup. This wine is a great value. Brilliant clear ruby color in the glass, tart red-fruit nose (cranberry, sour cherry, plum) with subtle hints of vanilla and roses. Tannins are firm but smooth. Dominant flavor profile is a bit like strawberry-rhubarb pie, with a cinnamon or allspice note and a trace of cola and, I think, cocoa. The finish is long, on the savory side, but at the same time both flowery and flinty. Very food-friendly. I found it benefits from a little air-time before drinking. You might as well. If you want something unique and special for a splurge-worthy occasion, get this bottle. The Pretender is so named because it is a white Pinot Noir, and you won’t find many of those. Without any skin contact, this grape becomes a totally unique creature, layered and complex as a traditional Pinot Noir but in a different key. Pastry cream, caramel, quince. Asian pear, honeysuckle, strawberries. Ethereal and wonderfully odd, it’s balanced as a ballerina and as food-friendly (think fatty fish, but keep thinking) as it is delightful on its own. A sui generis wine from a true Pinot-whisperer. If you are a rugged outdoorsperson please note this wine is also available in a hand can format. If you are someone who loves good Oregon wine that doesn’t require you to take out a home equity loan, Union Wine Company’s Underwood Pinot Noir is your ticket too. It doesn’t have the fussy, hyper-specific “site typicity” of some of the wines on this list, but when I call it “generic” I seriously don’t mean it as a put-down. It’s got a kind of “I AM PINOT NOIR” quality, an uncomplicated, easy to understand palette of flavors (cherry, baking spice, raspberry, a bit of currant). Sometimes you don’t want to be thrown a gauntlet by your beverage, and this one won’t. “Unchallenging” isn’t always what the situation calls for, but when it does (and it really sometimes does), this is a solid choice. Van Duzer doesn’t mess around, and this estate grown Pinot is a Pinot-geek’s wine, so consider it as a holiday gift if you have one of those in your life. If you are the Pinot geek in your life consider gifting it to yourself, actually. The nose is juicy, mostly black-fruit range (cherry, black plum, lightened by a touch of strawberry and pomegranate) with fairly intense florals (violet and either wisteria or lilac, something purple). Considerable barrel-driven aromatics, like vanilla and cedar and toast. Creamy texture, bright acidity, strong finish featuring cocoa, cola, cherries, a hint of anise and a little sandalwood. PS: Van Duzer’s mixed-vineyard Willamette Valley Pinot is about half the price and, while different, equally tasty-more herb notes and more strawberry than cherry on the mid-palate. If you can get your hands on either one, you’ll be happy you did.